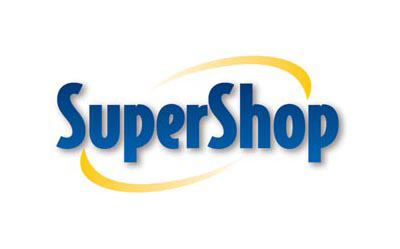 The super shop typically comprises meat, fresh produce, dairy, and baked goods departments along with shelf space reserved for canned and packaged goods as well as for various nonfood items such as household cleaners, pharmacy products, and pet supplies. Most super Shop also sell a variety of other household products that are consumed regularly, such as alcohol (where permitted), household cleaning products, medicine, clothes, and some sell a much wider range of nonfood products. Customers are not much happy with the collection of various products. Thy also want the well organized physical environment in super shop, and our main concern is to find out the physical environmental factors and which factors are more important for target customers. We are also trying to find out for which factors are more important for selecting a super shop. 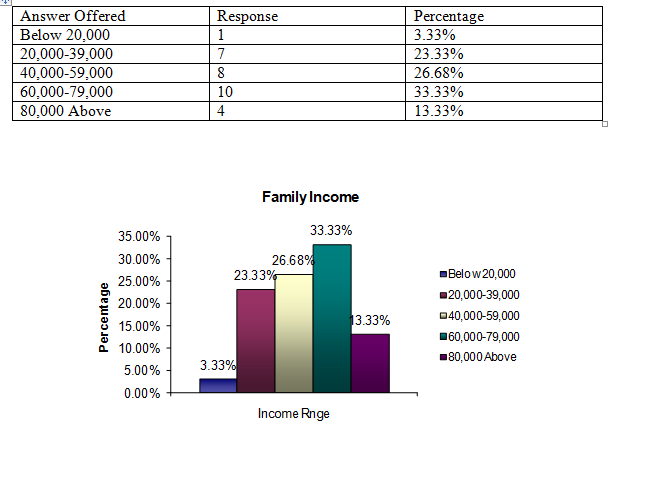 Primary Data: In our paper we used Excel for data analysis and made a questionnaire for survey within 30 peoples. We have analyzed our data with 30 people’s given information. Secondary Data: Secondary date we are help on past research and internet. Restriction within the problem: Non-cooperation from the customers in filling the survey forms, hiding information might be the restrictions within the problem. Absence of some information regarding data collection: While making the survey for data collection, some of the information, which was really essential, might be hard to collect. Rahimafrooz Superstores Ltd. (RSL) made a breakthrough in the urban lifestyles by launching the first retail chain in the country, ‘Agora’. Currently there are four Agora outlets at Gulshan, Dhanmondi, Moghbazar and Mirpurin Dhaka. With many more coming up at important locations in Dhaka andother major cities, Agora is endeavoring to fulfill the everyday shoppingneeds of the urbanites through fair price, right assortment, and best quality.Agora mainly focuses on food items – ranging from a wide variety of fish, meat, vegetables, fruits, bakery, dairy, and grocery – it also carries a vast array of other household, grocery, personal care, and miscellaneous products. At any point in time, there are nearly 20,000 different products available at Agora’s is committed to sustaining and growing as the most trusted, loved, and frequented retail chain. Agora has four outlets all over Dhaka situated in Dhanmondi, Gulshan, Mirpur, and Moghbazar. It has placed its outlets in the prime centers of city which seems to bemuch convenient to customers. Agora has also started their journey in Chittagong and Sylhet too. Agora has some Promotional activities which maintain its appeal to the existing andpotential consumers. It has regular promotion of services, existing & new products indaily newspaper to keep consumers aware of the available products. Also Agora has some exclusive seasonal offer, price reduction, sales promotion to attract the consumers as well. Many exclusive products like perfume, households and fresh basic foods are available in Agora which is priced higher than traditional market. Mainly Agora supplies many unusual unseasonable items which they priced higher because of the product unavailability in outside. Meena Bazar, which started its journey in 2002, has already extended its business to Khulna. The company has taken up a three-year plan to open outlets in Chittagong and Sylhet and at eight points in Dhaka.” Positive customer response is inspiring more investments in the thriving sector,” said Kazi Jamil Islam, executive director of Meena Bazar . In house product like sweet, yogurt, herbal product. At this moment, Meena bazaar is operating eight branches in Dhaka. InKhulna, they have opened another branch. Meena Bazar is sometimes offering for their customer on various occasions. One of them is Nandan Mega Shop. Nandan Group, with their first retailoutlet, Nandan Mega Shop, brought the like of Sainsbury’s in Bangladesh in the Year 2002. From 2002 they continue running their business successfully. They have a wide product verity and also give their customer quality product and service. They have 3 outlets in the Dhaka city. Those are Dhanmodi, Gulshan, Kakrailand Uttara. They are going to launch their own website very soon. boishak festival, Pujaetc. Arrange various types of festivals, weekends, 5 day long discount etc on their product. On the growth of the relatively new business, PQS tries to ensure customers’ satisfaction from the beginning and their quality products also attract customers. They have now five outlets at Uttara, Shanti Nagar , Dhanmondi,Gulshan andthe other one is in Elephant Road. They make offer by colorful festoons and promotional poster hung in andoutside the shop, along with gimmicks like raffle draw in various occasion.Like Eid, puja etc. 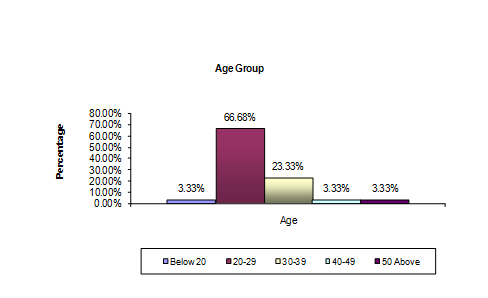 Analysis: As we see that, approximately 57% female and 43% male respondents are co-operating with us. And females are more interested to go super shops. We have learnt from our survey that a female are not going there only for necessary goods, they also going there for cosmetics, cloths and chock lets. Analysis: About 67%, young age’s people are main customers of super shops. And approximately 24% peoples are 30-39 ages and 3% peoples are below 20, 40-49 and 50 above. So we can see that which peoples are visit there most of them are young. Analysis: As we see near about 33% people’s income is around 60,000-79,000 taka, and about 27% people’s income is around 40,000-59,000 taka. 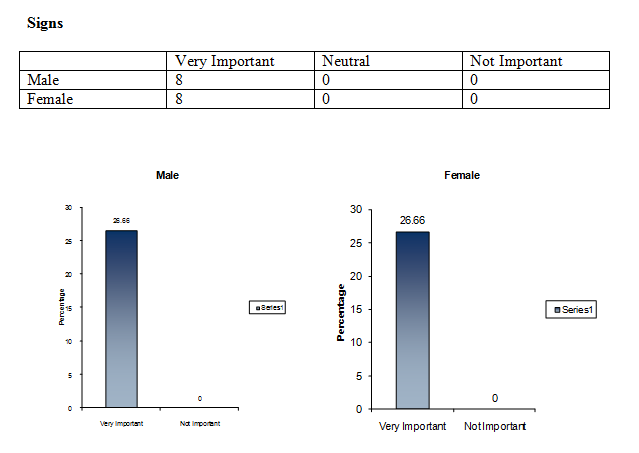 So we have learnt from our survey that high class peoples are main customers of super shop. Middle class peoples are also visit there but it is only 27%. 3% people’s income is below 20,000 taka, 23% people’s income is around 20,000-39,000 taka and about 14% people’s income is above 80,000 taka. 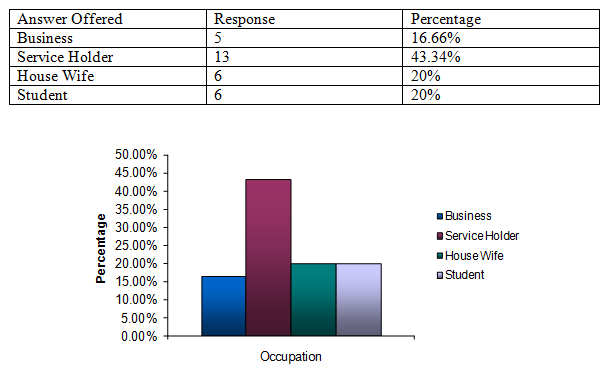 Analysis: Most of the peoples (43% approximately) are service holder, 20% respondents are house wife and student, and 17% peoples are doing own business. As we see that service holder is top of the other occupation group. Question 5: Which, if any, of the following supper shops have you visited recently for shopping? Analysis: There are various types of super shop in Bangladesh and we offered in our questionnaire only four of them. But we also offered an option if any respondents have another choice, they can write their name. Agora is one where approximately 33% respondents are going for their daily shopping. Question 6: What was your reason to visit the supper shop? 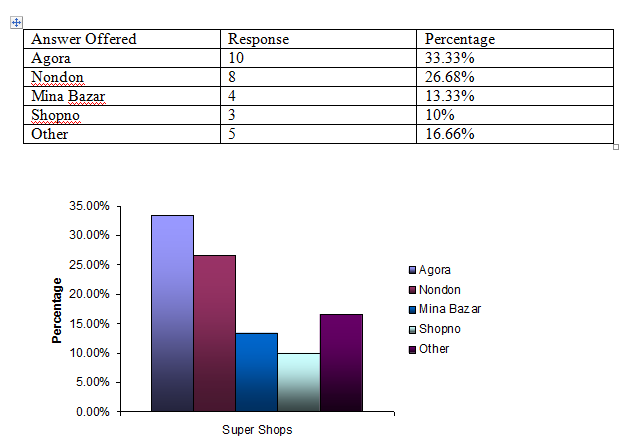 Analysis: We have find through our survey that, all respondents are going their chosen super shops only for shopping. And all of them are finding product availability, product quality and satisfaction there. But we have found only 2 respondents (out of 30) are going there just for look around. Question 7: How were you informed about this supper shop? Analysis: 63% (approximately) respondents have said that, they informed about this super shop from their family member/friends who have already visited this supper shop. 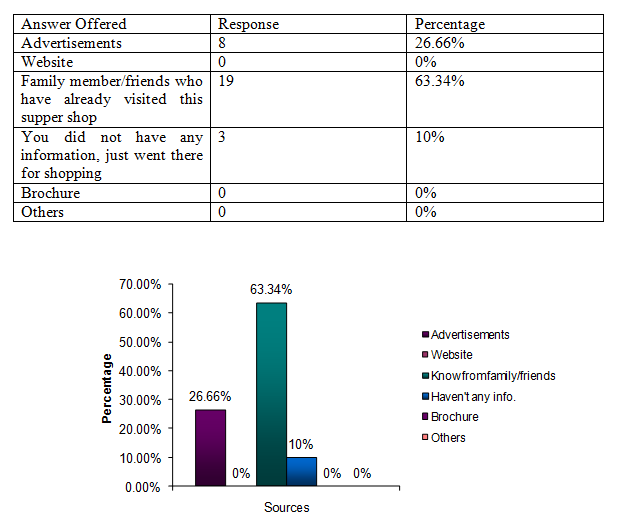 27% peoples informed from advertisement and only 10% peoples did not have any information, just went there for shopping. Question 8: Suppose one of your family members was to select a supper shop for shopping. Please rate the importance of the following factors other than the product availability in selecting a supper shop. Analysis: 80% People have said that, the Location is very important factor other than the product availability in selecting a supper shop. 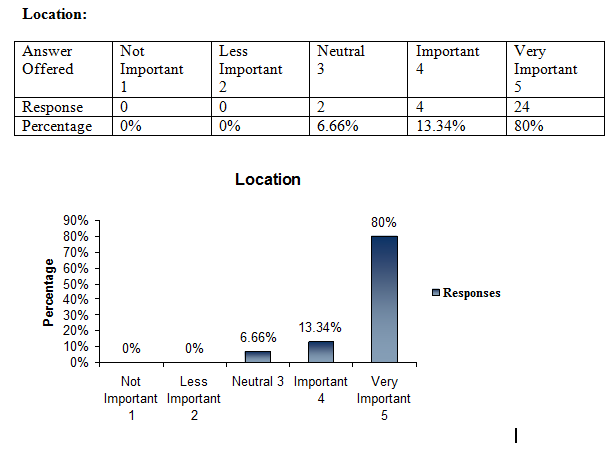 On the other hand 13.34% respondents have said that Location is important and 6.66% respondents are neutral. So, we can say that the Location is very important factor for selecting a super shop. Analysis: Aesthetics means beauties. 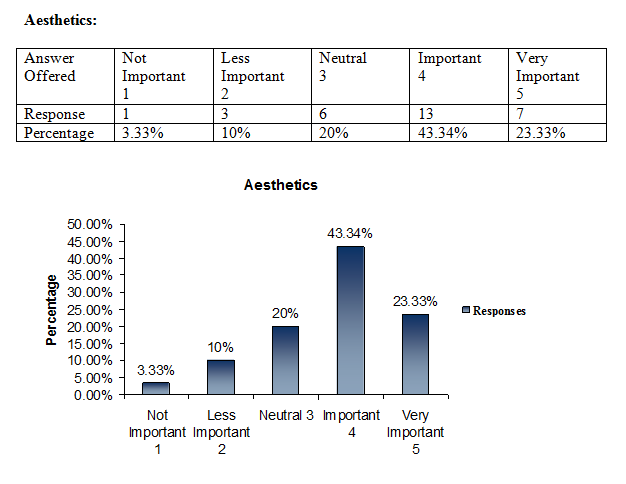 Around 43% respondents have said that the aesthetics is important for super shops but only 23% respondents said that it’s very important for selecting a super shop. And 4% said not important, 10% said less important and 20% respondents are neutral. So, we can say that Aesthetics is important for selecting a super shop. Analysis: Almost 30% peoples are neutral but 27% peoples have said that Convenience is very important for selecting super shop and 23% respondents said important. 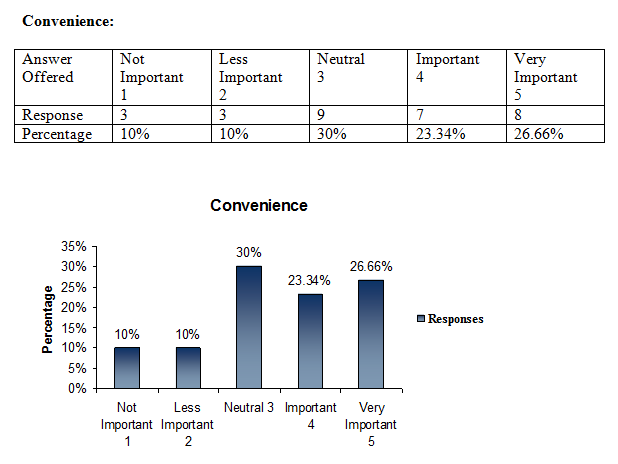 10% peoples have said Convenience is not important and less important for selecting a super shop. 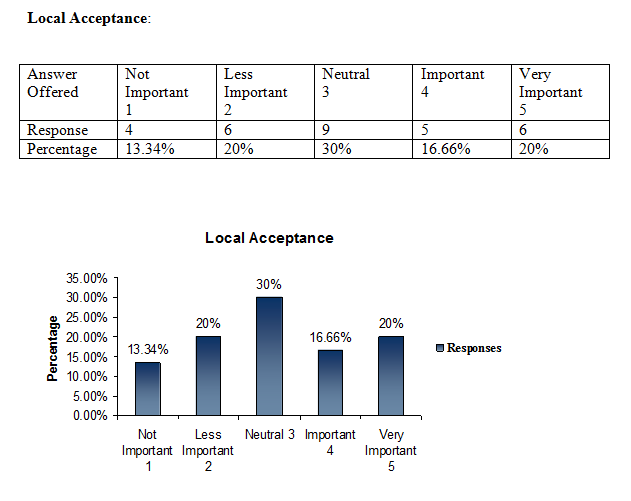 Analysis: 30% respondents are totally neutral for supporting Local Acceptance. But 20% peoples are saying less important and another 20% peoples are saying very important. We can see in our graph majority is in neutral, so we can say that Local Acceptance is not much more important and not less important for selecting a super shop. Analysis: 57% respondents think that shopping equipments is very important and 30% think that shopping equipments is only important for selecting a super shop. 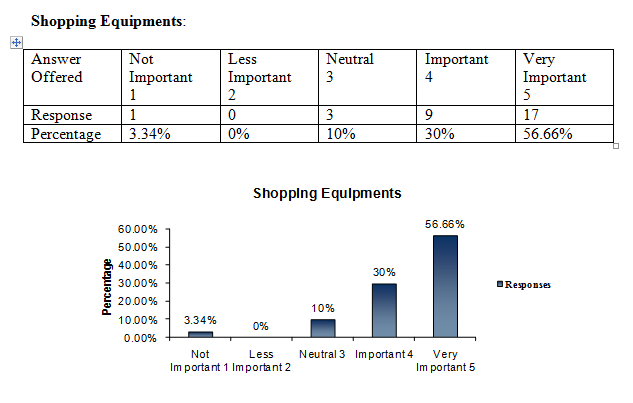 10% peoples are neutral and only 3% peoples said that shopping equipments are not important for selecting a super shop. 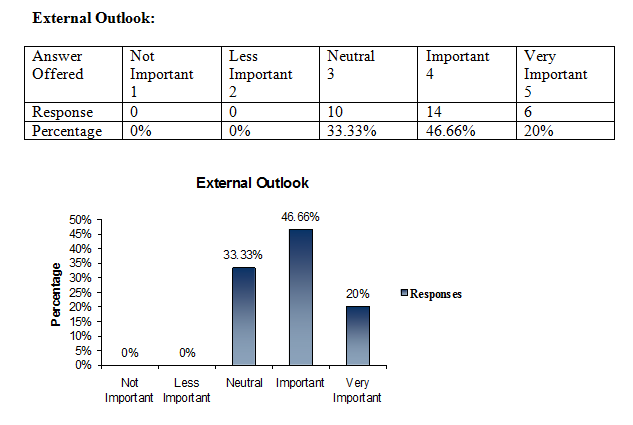 Analysis: External Outlook is only important, 47% peoples have said that. 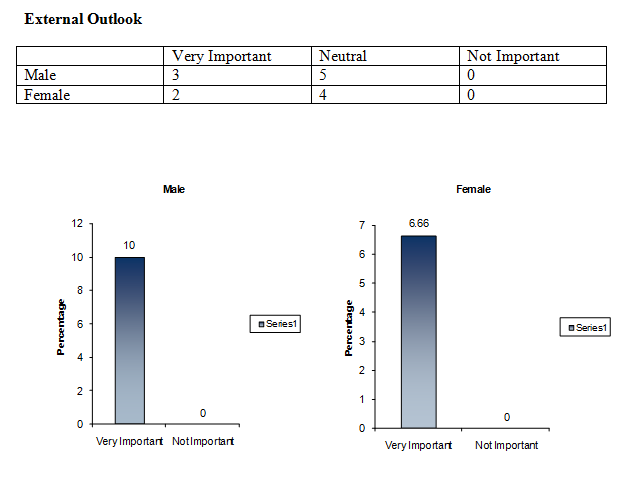 And only 20% peoples said External Outlook is very important and 33% peoples are neutral. So we can say that External Outlook is important for selecting a super shop. Analysis: Parking is moderately important for everyone. 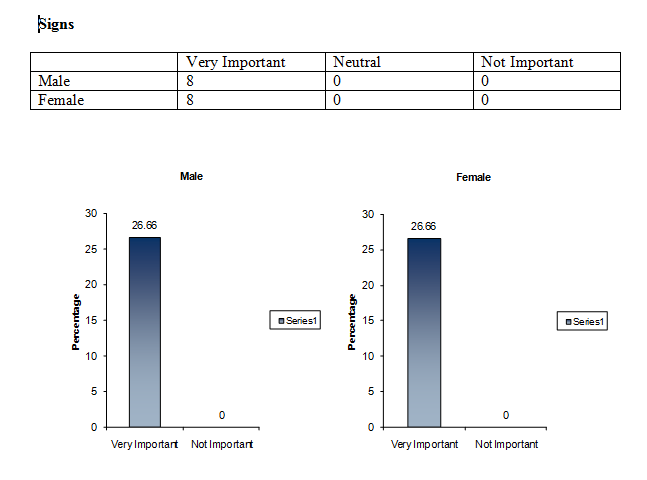 33% respondents said very important and 23% respondents said only important. 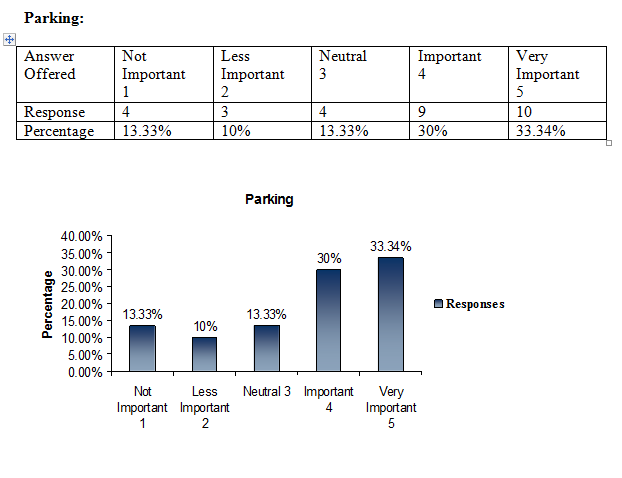 On the other hand 14% respondents think Parking is not important and 10% respondents think less important and 20% respondents are neutral. Question 9: Please rate the importance of the following factors other than the above factors, which you want satisfactorily while shopping in a supper shop. 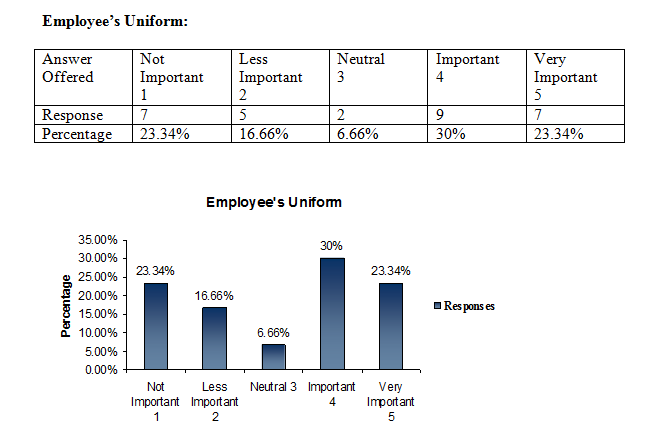 Analysis: Here we can see that 23% have said Employee’s Uniform is not important and on the other hand 23% respondents have said it is very important. But 30% respondents have said Employee’s Uniform is important. So, through our survey we can say that Employee’s Uniform is important for customer’s satisfaction. 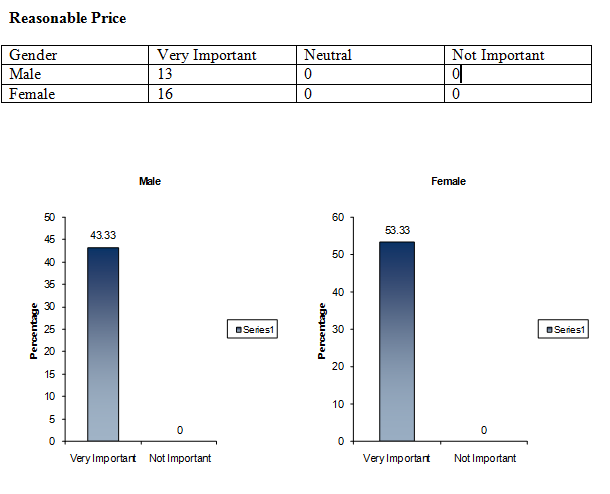 Analysis: Every customer wants to buy product in Reasonable Price and that’s why 97% people said that Reasonable Price is very important in super shop’s product for their satisfaction. 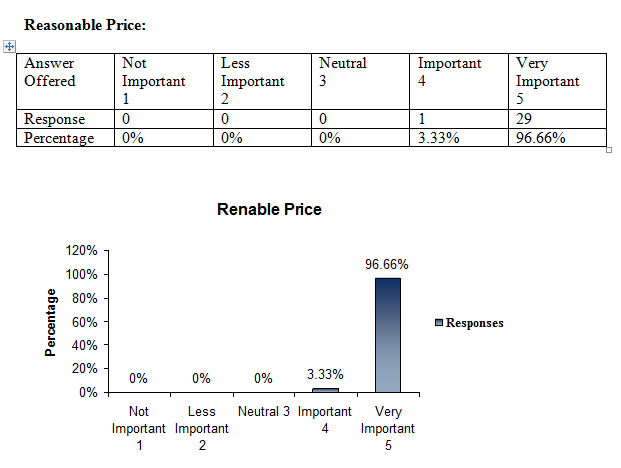 And only 3% respondents said Reasonable Price is important. 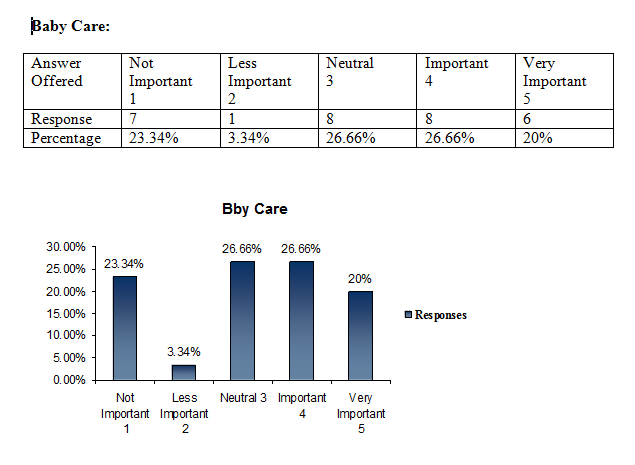 Analysis: Through our survey we have found that 27% people said Baby Care is important and 27% peoples are neutral. On the other hand 23% people said Baby Care is not important and 20% people said it is very important for their satisfaction. So we can say that Baby Care is moderately important for everyone. Analysis: Sign means name plate, exit and entrance symbol. 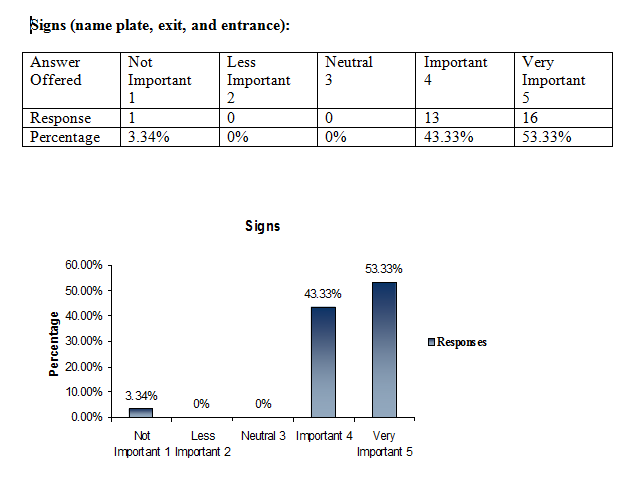 53% respondents think Signs are very important and 43% respondents think it is only important for their satisfaction. S0, signs are important for super shop’s customers. Analysis: 73% respondents think Security is very important for shopping in a super shop. And only 27% respondents think it is only important. 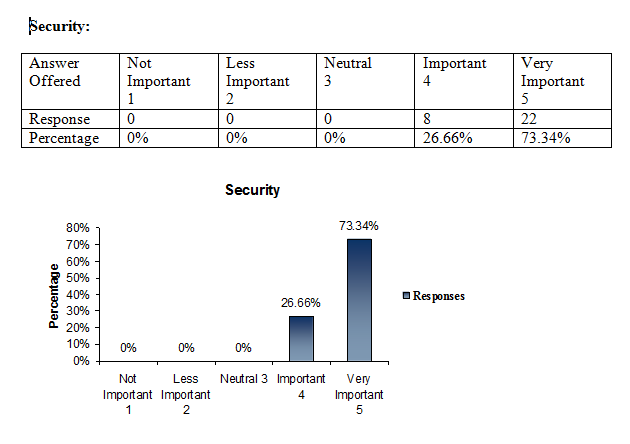 So, through our survey we can say that Security is very important for everyone. 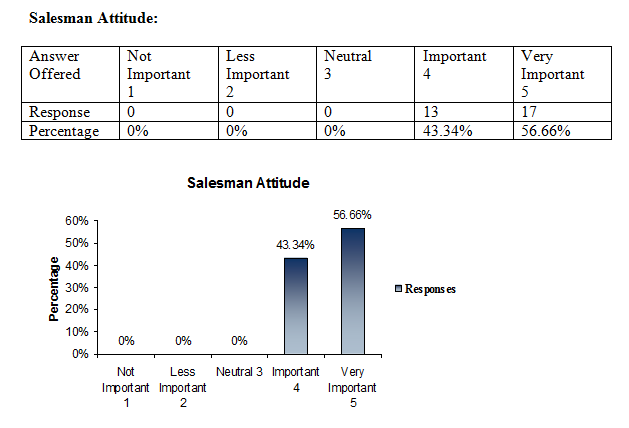 Analysis: 17 respondents (out of 30) have said Salesman Attitude is very important and its frequency is 57%. On the other hand 43% peoples said it is important for their satisfaction. 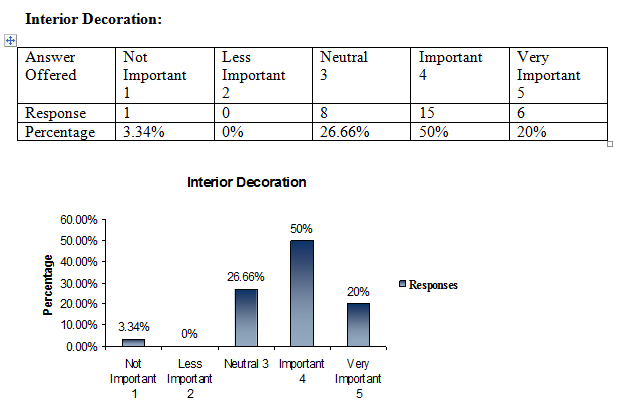 Analysis: 50% people said Interior Decoration is important and 20% said it is very important but 27% respondents are neutral. So, it is clear that Interior Decoration is important for every respondent. 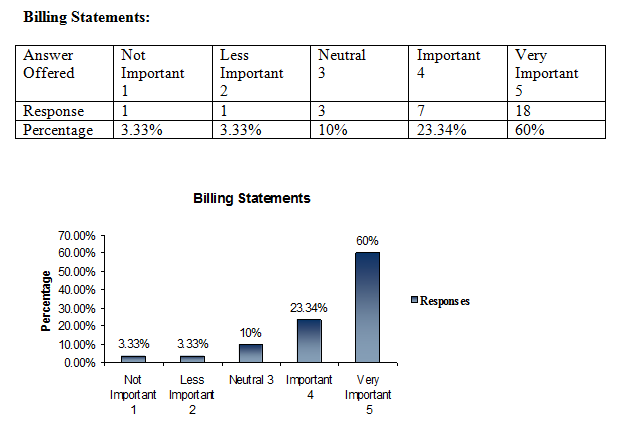 Analysis: Billing Statements is very important 60% respondents have said that and 23% have said it is only important but 10% respondents are neutral. Through our survey it clear that Billing Statements is very important for all super shops customers. 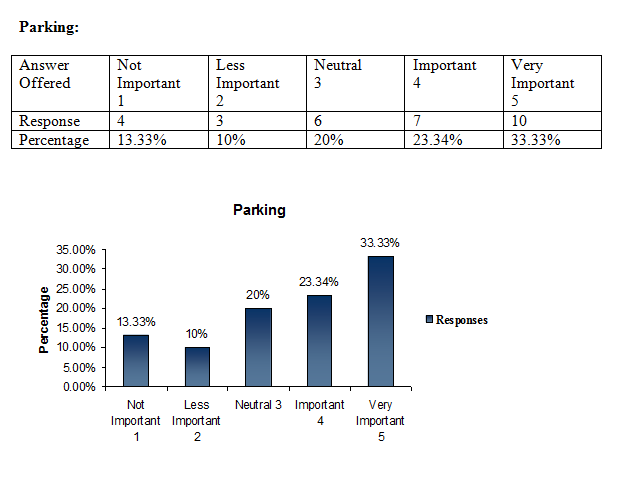 Analysis: More then 60% (30%+33%) respondents have said that Parking is very important and more then 10% (13%+10%) respondents have said it is not important. So, Parking is moderately important for everyone. 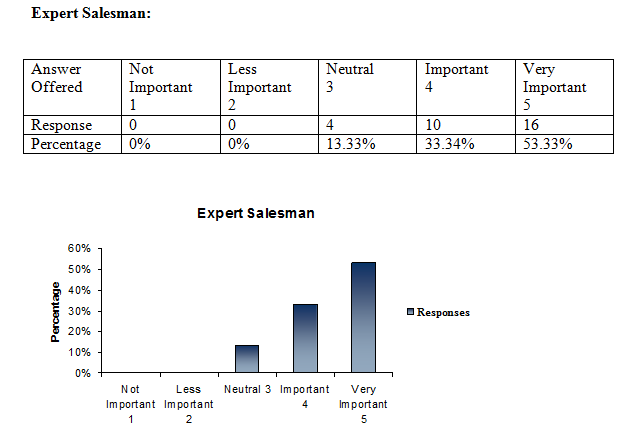 Analysis: Most of the people have said that Expert Salesman is very important and its frequency is 53%. On the other hand 33% people said it is only important and 14% peoples are neutral. So Expert Salesman is important for everyone. Question 10: Have you ever find any complaint to super shop management? 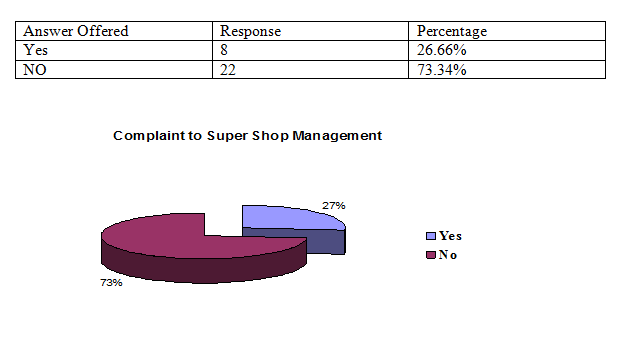 Analysis: 73% respondents have no any complaints to their selecting super shop’s management but 27% said they have complaints. 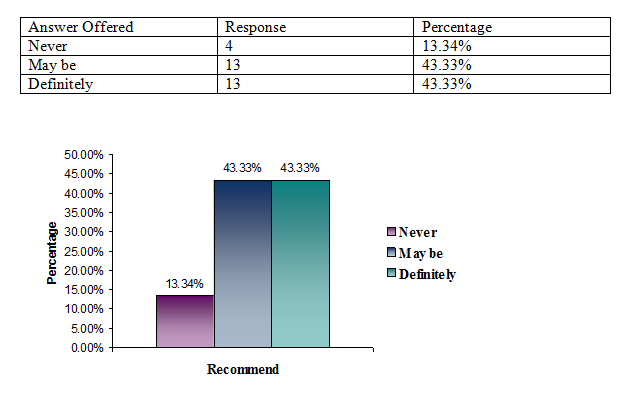 So, majority of our survey is saying that respondents have no any complaints to their selecting super shop’s management. Question 11: Would you recommend this super shop your friends? Analysis: Approximately 43% respondents have said that, they recommend this super shop for their friends. Also 43% respondents said may be, but only 14% said never. It means that which respondents said definitely or may be they get better service from their chosen super shop and which respondents said never they get lower service from their chosen super shop. The goal of a super shop is to give the consumers good services. But in today we are not getting that kind of services from all the shops. Some of the super shops have achieved goodwill for doing better work. Like Agora, Nondon, PQS, Mina Bazar etc. The other shops can follow their strategy. Some super shop’s service is so bad and this information we gathered from our respondents. One of them Shopno, their product quality and service is not so good and that’s why they can’t earn customer satisfaction. So we are suggest and recommend all super shops management if they are improve their super shop’s physical environment they can archive success. 80% People have said that, the Location is very important factor other than the product availability in selecting a supper shop. We can say that the Location is very important factor for selecting a super shop. Super Shops is a most important part in our daily life. People are more easily shopping through them. Super Shop business is growing in a high pace But they are maintain quality.